NPS Melody Musician Chair Dolly - 8 Cap. NPS Melody Musician Chair Dolly - 18 Cap. High-quality music chairs can maximize your students&apos; success. 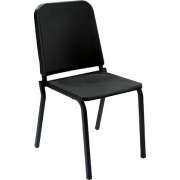 What kind of chairs should the school band sit in? Hertz Furniture&apos;s selection of musician chairs offers a number of excellent choices which provide proper support for your aspiring performers. The right music room furniture can go a long way. Show your students that you care about the performing arts by furnishing your band room with proper choir chairs. Academia music chairs even come with a complimentary Limited Lifetime Warranty. Free samples are available to qualified organizations. What makes a musician chair special? There are certain chair design elements that are particularly important while playing musical instruments. The back angle and positioning that is ideal for a musical setting is different than in a normal classroom. Because of these special requirements, student musicians shouldn&apos;t be sitting in regular school chairs while they are playing. Our music chairs have a healthy forward tilt that makes it easier for young artists to breathe as they play or sing and provides proper support for those who are holding instruments. Getting your rising artists to start out with proper positioning will help them continue playing in the best way possible well into the future. What is the easiest way to transport music chairs? 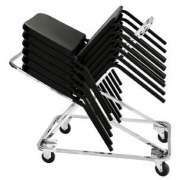 Support isn&apos;t everything, it is also important to ensure that your musician chairs are easy to transport. Stackable chairs help maximize storage space and facilitate easy transport. This arrangement is ideal for any church or school where the performance and practice spaces are used for a number of purposes. Getting musician chairs into position in a timely fashion is helpful to students, custodians and band teachers alike. 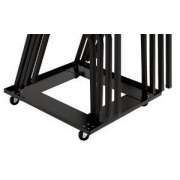 For the ultimate convenience in transport, a chair dolly is the ideal option. 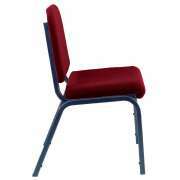 What are the best chairs for a school music room? The Poly Musician Posture Chair from Academia is a durable option that is great for music rooms, band rooms and performances. It is angled forward 5 degrees to facilitate proper posture and stacks up to 10 high. This budget-friendly option is available in a selection of vibrant hues so you can color-code according to section, coordinate with other school decor, or use it to bring in some exciting new classroom colors. It comes in 16” and 18” heights, so even younger performers can play comfortably. The Melody Musician Chair from National Public Seating is ergonomically-designed to promote a healthy posture. 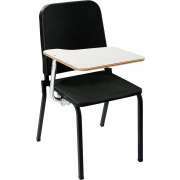 It features a 97-degree seat-to-back angle so students can breathe easy as they perform. Deep backs provide increased lumbar support, so musicians are able to stay focused throughout the entire score. The proper positioning promoted by the melody chair facilitates increased focus and better performances. 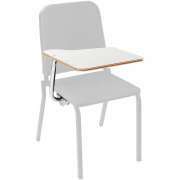 Another convenient feature of the Melody Musician Chair is an optional tablet arm. This excellent writing surface makes these music chairs good for frontal instruction as well as playing. They enable you to easily bring music into the educational environment. If modifications need to be made to the piece that the class or band is learning, musicians can simply pull up the tablet arm and record them. Fold-away tablets are available in both right- and left-handed configurations so anyone can enjoy this great addition. Where should the church choir sit? Unlike the chairs that are used in a school band room, church chairs for the choir need to look nice enough for a house of worship. Additionally, because the choir usually sits on these chairs throughout the whole service, they need to be super comfortable. Because comfort and support depend on more than just posture, we offer cushy upholstered choir chairs from KFI. This supportive seating option features a fully-padded back and seat as well as a 95-degree back-to-seat angle. The KFI choir chair is available in a wide range of upholstery options so you can coordinate your performers&apos; seating with pew seating, auditorium seats or band room decor. 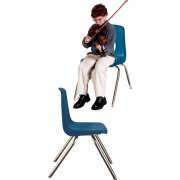 Whether they are using wind, percussion, string or voice, your budding superstars are sure to benefit from appropriate music chairs. Hertz Furniture&apos;s affordable selection of musician chairs offers multiple viable options that provide excellent support and an attractive appearance. When you invest in great music room furniture, you provide student musicians with the right tools to succeed for many years to come.